a Roman roof tile was found in a Brookside garden in Bedhampton? where you can see the plans for the new Bidbury Mead park entrance? John Keats spent his last night on English soil at Bedhampton? why The Elms architecture is called Strawberry Gothic? who was the very special guest who came to dinner at The Elms? The Bedhampton Historical Collection (BHC) was founded in 2007 with an impressive collection of artefacts and ephemera donated as a bequest by the late Cynthia Hoy, a founder Trustee of the Bedhampton Manor Trust. The collection is managed and cared for by the BHC team and has now been catalogued on a searchable database with support from Hampshire Museums Service for local studies, research and education purposes. It is hoped to provide a display in the museum room at all Secret Bookshop events. The BHC has again registered with Heritage Open Days to be a part of this great national project. 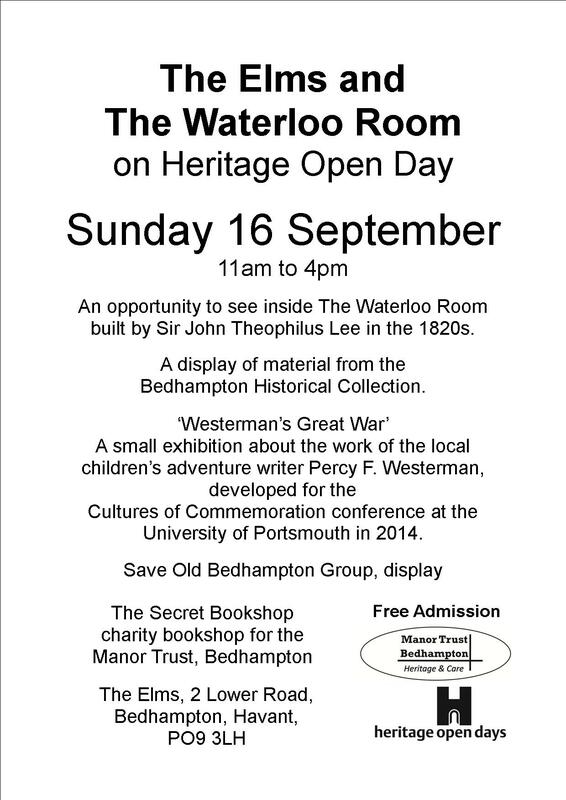 The Waterloo Room and the Bedhampton Historical Collection Research Room will be open from 11am to 4pm. Margaret Stanger leads the team of local historians including Jill Munden, Alan Palmer and Nigel and Wendy Gossop who are working on this collection. The Bedhampton Historical Collection team wish to thank the many people who have contributed to the development of the collection. Manor Trust Heritage Day. The Bedhampton Historical Collection is housed in the Museum Room at The Elms and includes books, magazines, photographs, press cuttings, documents, maps, artefacts and notes from local historians and covers topics that include local history, military history, Royal Family and more. We welcome visitors and are usually there on Wednesday mornings and can be available at other times by appointment. We are keen to build on the collection and are constantly on the lookout for new material. We welcome any donations of documentary material, manuscripts or photographs. If you are reluctant to part with photographs or documents, we are happy to arrange to copy them and return the originals to you. September 2016, 2015 and 2013: Heritage Open Days - The Museum Room exhibitions include local photographs through the ages and in 2013 a unique display of items associated with the Duke and Duchess of York's world tour in 1927. July 3rd, 2012: The Bedhampton Summer Show – a display of Royal Memorabilia in celebration of the Queens Diamond Jubilee. May 26th and 27th, 2012: The Art Show – The Elms, included a display of Royal Memorabilia in celebration of the Queens Diamond Jubilee at the Museum Room. September 11th, 2011: Heritage Open Day - The Elms, Waterloo Room, included a display of local maps, past and present. September 12th, 2010: Heritage Open Day - The Elms, Waterloo Room, included a display of The Elms history. September 2008: Havant Literary Festival – The Elms, Waterloo Room, a display of Keats Memorabilia during a poetry reading. The BHC Team are pleased to present a series of talks staged in the Waterloo Room of The Elms PO9 3LH. Please follow the link to our News page . All talks will start at 7pm and are expected to last approximately one hour. Doors open at 6.30pm. The BHC Search Room will be open to visitors to the Manor Trust Garden Party . Please feel free to drop in to explore the search room or chat with some of our volunteers. There will be plenty of photographs of Bedhampton in the past to get our visitors talking. The Waterloo Room at The Elms was thrown open to visitors on Wednesday 17th, Thursday 18th and Sunday 21st June. The Room was a banqueting hall built to honour the success of the Duke of Wellington at the Battle of Waterloo. It was built by Sir Theophilus Lee, a relation by marriage of the Duke of Wellington and the owner of The Elms at that time. It is a splendid piece of architecture with ornate plaster mouldings and pillars. 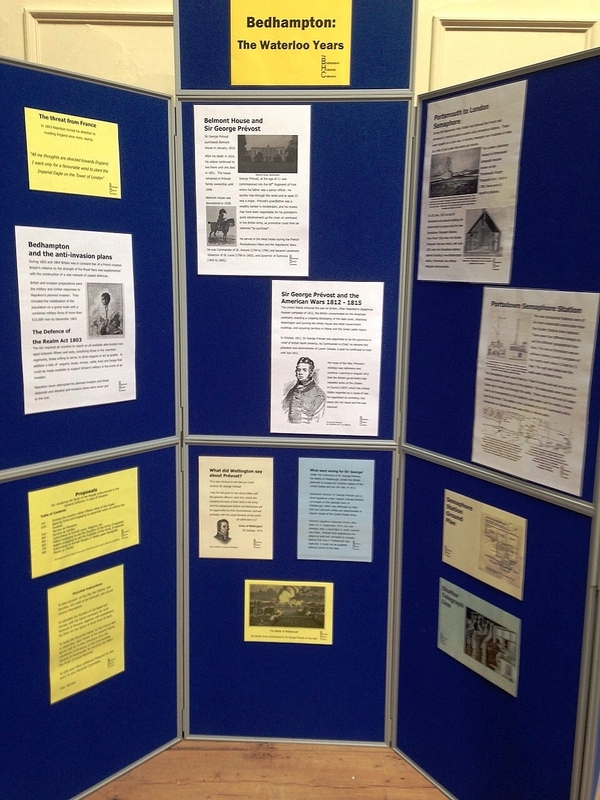 The team mounted a comprehensive set of displays (one is shown on the right) that focused on the history of the Elms and the ancient village of Old Bedhampton. On Sunday the team were on-hand in person to answer visitors questions and the team also made and served light refreshments that were much enjoyed by our visitors.